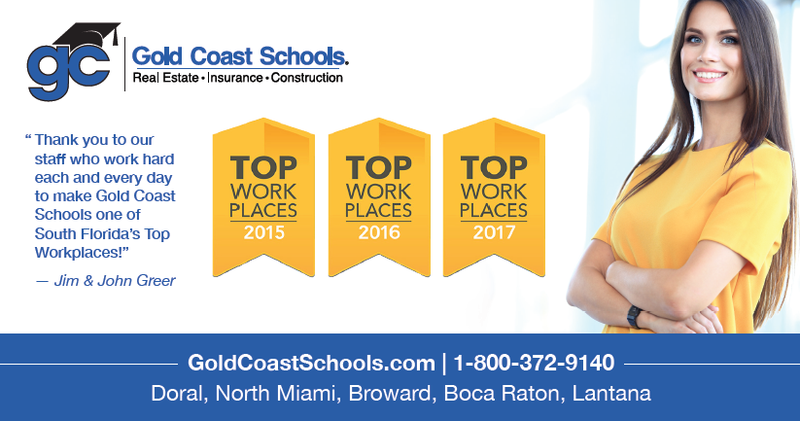 Gold Coast Schools placed #10 in the SunSentinel’s Top Workplaces for 2017. This is the 3rd year in a row that Gold Coast has placed in the top 10 workplaces for small business, and is something that our more than 124 employees are a proud to be a part of. Since 1970, Gold Coast Schools has severed as Florida’s leading provider of online and classroom education for real estate, insurance, construction and several other professional licensing industries. The success and continued growth of Gold Coast is largely attributed to the dedication of our staff. Without their hard work both inside and outside of the classroom, Gold Coast would not be able to proudly serve more than a million students with the pre-license, continuing education, and industry training courses that they need. “As a company, we are 100% people focused. It great to see that our long history of serving satisfied students is paired with a staff full of people who enjoy working here each and every day.” John Greer, Owner. Gold Coast looks forward to continued success through 2017 and into the future.